Come visit our newly renovated 1932 Vintage Cottage located 1/2 block to the Embarcadero and Harbor. We are just steps away from a variety of many unique and tasty Restaurants, Music, Craft Beers, Wine Tasting, Harbor Cruises, Boat Rentals, Fishing Excursions and much more. Enjoy the ambiance of this cute little 1 bedroom 1 bath Duplex Cottage which includes a full kitchen with all the kitchen ware to cook at home. The kitchen includes a stove, refrigerator, Microwave, Granite Counter tops and a refrigerator. This cottage comes with a Queen size bed and a Full sleeper Sofa perfect for two small adults or children. The bath room has a newly tiled tub shower and attractive vanity with nice plush towels. There is also a small entry deck with a couple chairs. You can enjoy the view of the Harbor, Embarcadero and the Famous Morro Rock while sitting back and enjoying the views. We really enjoyed our stay at Pacific St. Cottages. We relaxed, watched the sea otters, ate lots of seafood, and relaxed in our cottage. It is so close to The Embarcadero, but it is peaceful (except for the barking sea lions that we could hear at night, but we loved that! The bed was fabulous. Gary and Gary were very responsive. We had a wonderful stay. Thank you! The cottage is very comfortable and has everything that you would think you'de need from home. So just bring your food and sunscreen. I was also amazed how clean the housekeeper kept it. When I arrived it was spotless. Great location. Nice setting. Easy l place to stay. Harbor sounds are fun! Only one wine glass. Had to share with a straw. Dishwasher did not work. Straw was hard to wash. Bed was very comfortable. Great shower! Didn't see a better place while exploring. 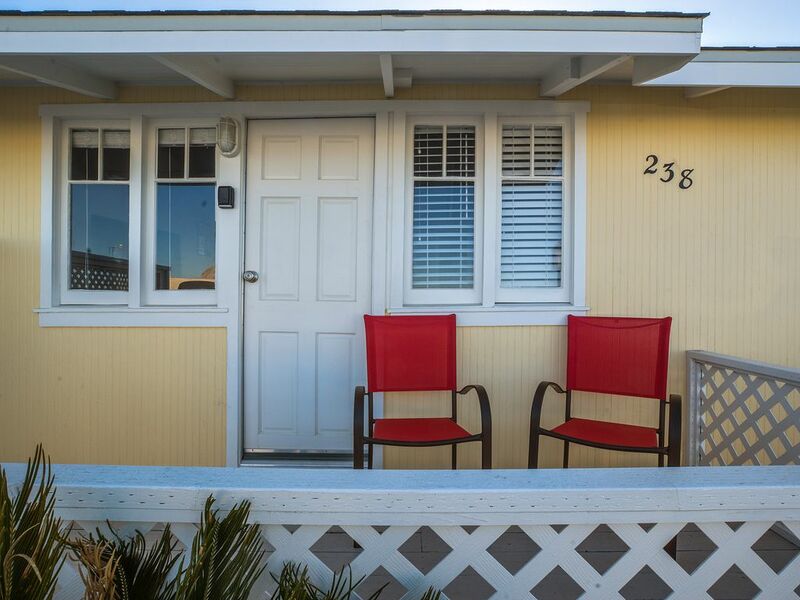 This 1-bedroom cottage is at a great location and within walking distance of restaurants, bakeries, and shops. It is also within walking distance to the supermarket and the library (we got some nice finds at the book sale they were holding!). There is a fantastic view of Morro Rock when you step outside. We were with our young kids and they enjoyed the Tidelands Park, also walkable; it is small but gave them a couple hours of play what with new friends to be made and their own imaginations. The cottage was small but thoughtfully appointed with small but updated appliances, plenty of linens, and was well-stocked with paper towels, trash bags, soap, etc. Gary was very responsive and it was very easy to extend our stay by another day. We were sorry to leave Morro Bay, and we’d definitely book a cottage with Gary & Gary on our future visits! Location is perfect - a half a block from the Embarcadero, large park with children's playground in walking distance, seals barking within earshot, kayaking and other water sports, boat tours, shopping and eateries within walking distance, walking distance to downtown area with more eateries, movie theater and stores. Hosts, Gary and Gary are charming, accessible and conscientious. Accommodation is clean, spacious, full kitchen, separate bedroom, outside patio with bar b q and view of Morro Rock. Parking on property. A real plus that pets are allowed with approval of the owners. Thank you Stephanie! We of course appreciate your review very much! This residence was built in the 1930's,our location is unique for anywhere in California. These view lots in Morro Bay were taken a long time ago. Gary and I are best friends and have known each other for many years. Sincerely, our guests enjoyment is of uppermost importance, your review of our property is very gratifying.